On week days, I often eat a light breakfast of yogurt and fruit, but when the weekend rolls around, I like to spend a little more time in the kitchen and prepare heartier dishes such as this easy Mexican scramble. You can use eggs, egg substitutes, or even egg whites to make this dish depending on what you prefer although I used Egg Beaters brand http://www.eggbeaters.com/ which has the flavor and color of eggs with half the calories. Black beans are rich in protein and fiber, and help to make this dish both filling and delicious. I used reduced fat cheddar cheese, and topped my scramble with a spoonful of fresh salsa and a dollop of heart healthy guacamole. Egg Beaters supply protein without fat and half the calories of regular eggs. Black beans are rich in both protein and fiber. Reduced fat cheese reduces calories from fat. 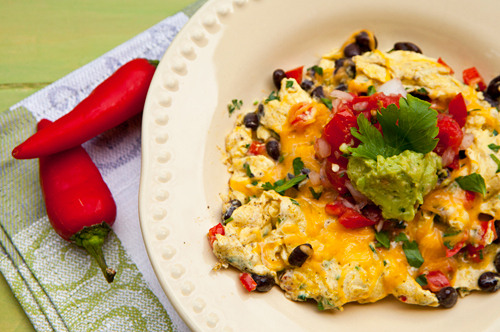 A hearty Mexican flavored egg dish. Heat the olive oil in a frying pan and cook the onions, red pepper, and jalapeño until tender. 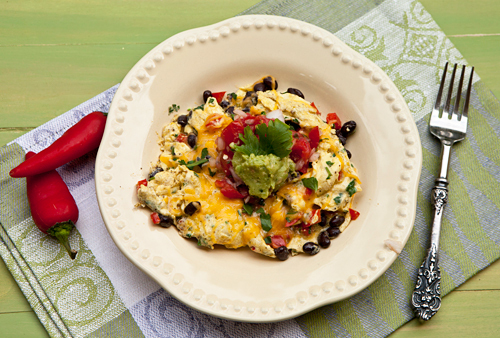 Add the Egg Beaters, cilantro and black beans and cook, stirring to scramble as they cook. Top with the cheese and let sit in the hot pan for a couple of minutes to melt the cheese. Divide the eggs between four dishes and spoon a little of the salsa and guacamole on top.